In some cases, the ATO troops were forced to return fire. Russia-backed militants in Donbas 43 times attacked Ukrainian army positions over the past 24 hours, the ATO press center said in a statement 9 June. The militants fired grenade launchers of various systems and small arms on the Ukrainian positions near the villages of Luhanske and Novhorodske, as well as heavy mortars near the villages of Maiorsk and Zaitseve. 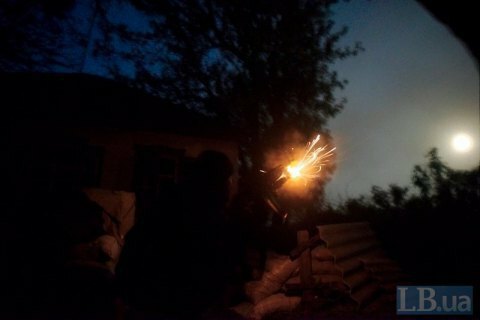 In the Mariupol sector, after dark, the occupiers repeatedly fired 122 mm self-propelled guns on the Ukrainian positions near Novotroyitske, and 82mm mortars near Pavlopil and the town of Maryinka. The enemy fired heavy machine guns on army positions near Talakivka and Shyrokyne. The ceasefire was repeatedly violated in Luhansk region, where militants fired small arms and rocket-propelled grenades at government troops near the village of Novozvanivka. In some cases, the Ukrainian troops were forced to return fire.